Study: methane emissions linked to human activity for millennia. October 6, 2012. Above: carbon isotopes. Below: methane. Using new data from the NEEM and EUROCORE ice core drilling programs, researchers from the Niels Bohr Institute have published a study in the journal Nature that reconstructs how different natural and anthropogenic activities contributed to methane emissions over the last two millennia. An important but frequently ignored greenhouse gas, methane is released into the troposphere from three sources: biogenic (wetlands or rice paddies, for instance), geological (for example, mud volcanoes) or pyrogenic (including biofuel or coal burning). Different methane sources have different isotopic signatures, meaning that scientists can use ice cores to trace how and why methane rose and fell over time. Previous studies of carbon isotopes in Antarctic ice cores suggested that the contributors to methane emissions that likely resulted from human activity - like biomass burning - exceeded what was expected for preindustrial conditions. The new ice cores examined by lead author C.J. Sapart and his colleagues confirm the importance of anthropogenic methane emissions by revealing, for example, that between 100 and 1600 CE human activity, through environmental changes like forest clearances, may have been responsible for 20-30% of total pyrogenic methane emissions. According to the authors, charcoal burnt by the ancient civilizations of Rome, India and China contributed to an early peak in methane emissions that was not matched until the warmth and relative dryness of the Medieval Climatic Anomaly intersected with increased human populations to encourage greater pyrogenic methane emissions. 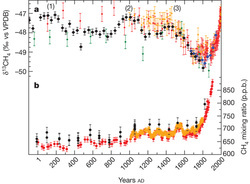 A third peak occurred during the height of the Little Ice Age, when biogenic emissions declined even as pyrogenic methane increased, possibly influenced by increasing industrial activity and renewed forest clearances. After 1800 methane emissions rose sharply and, stimulated by the ever-increasing scale of industrialization, continued accelerating into the present. This study, which has received significant media attention, might have benefited from the contributions of an environmental historian to nuance some of the claims made about, for example, the relationship between human activity and woodlands. Nevertheless, the study's conclusions dovetail nicely into the arguments of recent papers that explore the possibility of anthropogenic climate change prior to industrialization. While some of that work remains controversial, it's safe to conclude that many of the environmental problems of the present are caused by drastic changes in the scale - not necessarily the kind - of our environmental relationships. C. J. Sapart et. al., "Natural and anthropogenic variations in methane sources during the past two millennia." Nature 490:85 (2012).